This is the third year of yarnbombing at Maker Faire Singapore. Read the interview with Yarnbombing SG to find out more about this amazing craft project! This year, you are making a really huge 3m x 2m project. What is it going to be? Mona: Our project for Maker Faire is Merlion’s Magic Garden. It is centred around the 3m by 2m picture of Merlion, which will be completed before Maker Faire 2016 and showcased there. Its garden will be a continuing work in progress throughout the Maker Faire weekend. We invite visitors to come and contribute to it. Anything on a garden theme and that has been crocheted/knitted are welcome. Can you share with us some basic information on the idea creation, the planning and the actual execution? Mona: Three of us started brainstorming in November 2015. Yaney put the ideas together and came up with the final design. She couldn’t make it any smaller without affecting the design. So we decided to believe that the community will come together to make 2200 squares and THEY DID!! We’ve received squares from Singapore, Malaysia and UK. Work started in January 2016. We met monthly but many contributors made their squares at home and mailed in their squares. Who are the people who contributed to this project? Mona: There are a mix of people who participate in our projects. Some are expert crocheters and enjoy our concept which is a different application of crochet. Some have just picked up the craft and enjoy the wacky ideas that bounce around the group. Its much more fun to craft together. How did the LED collaboration came about? Mona: We have been collaborating with OneMaker Group (OMG) since Q4 2015 to create projects that have the element of electronics and textile, and we eventually gave birth to LEDmon (#LEDMON). They were keen to chip in when we shared our concept with them and are looking to breathe interactivity to the Merlion! Mona: We will be teaching how to crochet flowers throughout the Faire. Learn, take one away and make one for Merlion. We also have 2 scheduled workshops where we teach how to crochet 3D bees or mushrooms. Sign up at Crochet 3D Bees/Mushrooms. We will also have a “Find US” puzzle for Maker Faire visitors. There will be a gift for those who can find them (while stocks last)! Mona: Yarnbombing SG would also like to call out for crafters who would like to donate 3D amigurumi to Merlion’s garden and the Find US puzzle activity. Just approach the volunteers at the booth! Don’t forget that Maker Faire Singapore (5th edition!) will be taking place this weekend (25 & 26 June 2016) at the Singapore University of Technology and Design, between 10am to 6pm. See you there! It is a joy to have known Sze Sze, an avid crafter/tinkerer, since a couple of years back when she first took part as a maker at one of our Maker Workshops and when I first interviewed her. It was the year 2014. 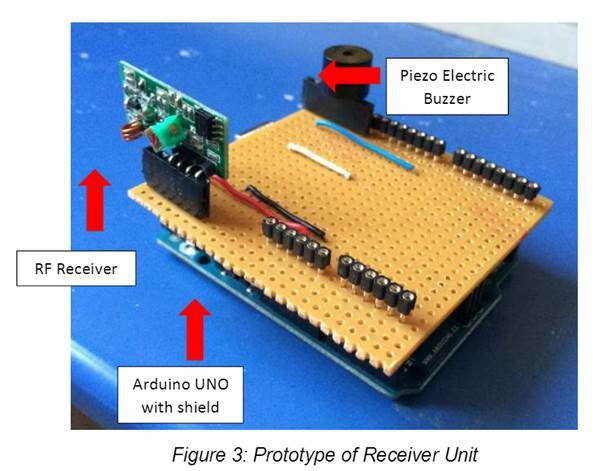 This is now Sze Sze’s third year as a participating maker at Maker Faire Singapore. 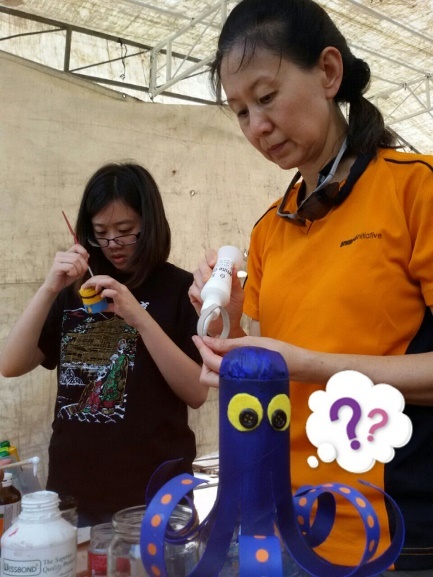 Read on to find out more about Sze Sze, her creative crafts and her thoughts on Maker Faire through our interview with her. Can you give a brief introduction of yourself? I am a digital creative by day with an insatiable appetite to create visual tidbits. Prior to crafting tangible playthings, I was very much into creating digital graphics. I relish in a vibrant array of clay figures and customized toys inspired by daily observations and popular culture. Some of these crafts feature iconic characters and structures of yesteryears. What will you be showcasing? I will be featuring a mix of cute clay figures and customised mini Lego figures! Even my display cases are handmade out of cardboards. Having participated in Maker Faire for 3 years (starting with being a visitor in 2013), can you share with us what you like about it? The fact that it’s like a huge gathering of people crafting or making quirky things. The gathering of such creative energy makes it very inspiring and motivating as an individual. I had a blast in the first year I participated as a maker. I felt like a kid in a toy store – with the toy makers around! My brain felt like it was on steroids looking at all the experiments that other people are showing, and twirling with the possibilities of the products that some of the vendors are selling. It was also a very beneficial experience to meet similar makers that kindly shared insights and advise on how to market my work, and provided opportunities to join their meet-ups. I’m happy to just be at the Maker Faire Singapore to soak in the great vibes! I am looking forward to meeting more like minded people and get even more inspired to tinker with things that I don’t normally think of. If asked for tips for new participating makers, what would you advise? This is a great opportunity to mingle with some of the brightest minds and very creative folks out there. Be open to talk a lot, and get inspired. Depending on the nature of your works, be prepared to mingle with lots of kids too. Also get display cases to protect your works if they are fragile. If possible, have your tools and raw materials on display. Visitors like to ask about them a lot! Interested to read her interview two years ago? Here’s a link for you. Do not miss the chance to meet Sze Sze in person and be amazed at her creativity. Check out her booth at Maker Faire Singapore that will be held at the Singapore University of Technology and Design (SUTD) on 25 & 26 June. Three years ago, Joyce Lim first took part as a participating maker in the Singapore Mini Maker Faire held at Senja-Cashew CC. It was the first year we had a maker who showcased tatting. To promote tatting, Joyce even went up the stage during our inaugural Nico Nico Gakkai quick presentation sessions hosted by Takasu Masakazu from teamLab. Last year, Joyce took part by conducting a workshop. While Joyce is a cardmaker, jeweller and a tatter, we focused on her tatting expertise when we interviewed her two years ago. This year, let’s take a look at her other areas of craftsmanship, clay art, papercrafts and handmade jewellery, which she will be exhibiting at her booth. Joyce was first exposed to clay art in Primary 1 through a common modelling material that most of us would be familiar with, plasticine. Later, she discovered polymer clay, and subsequently started taking clay modelling classes, learning from books and through a friend. Besides clay art, Joyce also enjoyed papercrafts, starting from origami in childhood to washi papers later on in life, making pretty paper boxes and Japanese paper dolls. She also enjoyed rubber stamping and paper tole art, something that I personally enjoyed too! To ensure the hobby is sustainable, Joyce started selling her artwork, and even consigned her cards to retail shops. Now, Joyce fully concentrates on customisation of corporate cards, wedding and other stationery. Comparatively, jewellery making came later in life for Joyce, where she helped her aunt sell handmade earrings. Thereafter, she also started making her own jewellery which her mother helped to sell, garnering good responses which spurred her interest to further her craft, taking lessons to learn about metal clay and mixed metal, and opening more possibilities in terms of designs and materials. Joyce’s interest for crafts stems from her love for books, stationery and cute items, as she fondly recalled her experience selling stationery at a college co-operative. In particular, she is drawn to bookmarks and cards, especially hand-made ones. She shared that she once made a handmade farewell card for a colleague, and many years later, that colleague met a common friend of theirs and asked after her. A simple thought goes a long way! As this year’s Maker Faire, Joyce would like to encourage people to make rather than buy, as gifts with a personal touch will accompany one down memory lane in life. Drop by her booth and get some inspirations for your next craft projects! When asked about Maker Faire Singapore, Joyce felt that it is unlike the rest of the markets she has participated in. Over the two years, she has met a few tatting fans whom she remained in contact with. 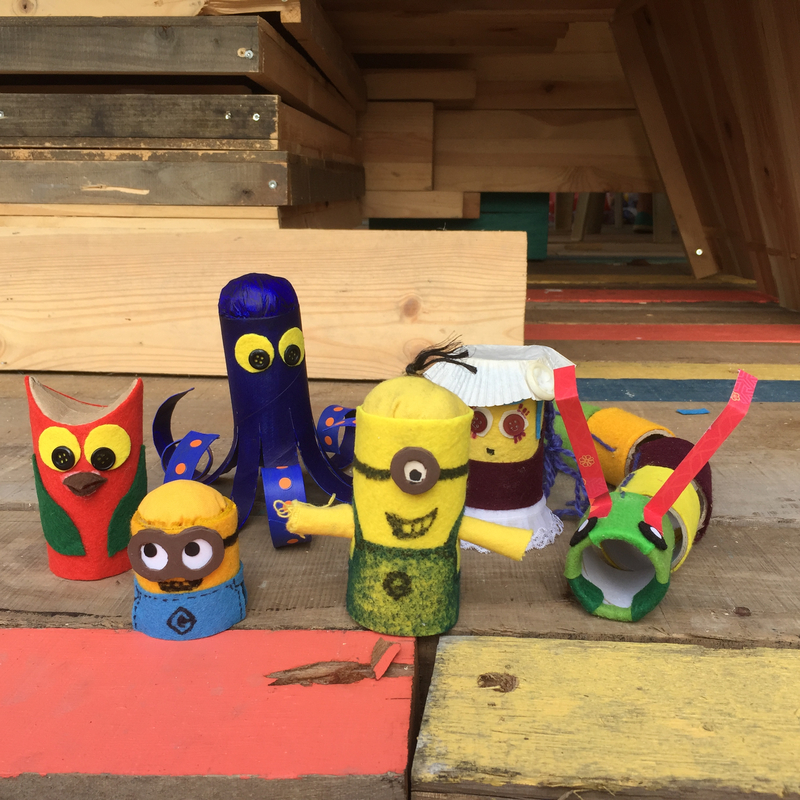 It was also through contact with visitors to last year’s Maker Faire that prompted her to design her own children art class, following her experience last year to conduct clay art classes at primary school. This includes the make-and-take papercraft session, tatting, and clay art workshops Joyce will be introducing at her booth in the upcoming Maker Faire. Excited to join in Joyce’s workshop at the upcoming Maker Faire Singapore 2016 (25 & 26 June) at the Singapore University of Technology and Design (SUTD)? Stay tuned to our workshop webpage for more info, or check out at Joyce’s website for the latest updates. Can you see these stickers? This year marks the 5th year that Singapore is organising our Mini Maker Faires and featured Maker Faires, and we are definitely looking forward to the exciting projects by our makers on 25 & 26 June at the Singapore University of Technology and Design (SUTD). Starting with Mr Edmund Wee’s introduction, do stay tuned to our subsequent posts on other makers with very interesting projects. Edmund Wee is a web designer from Singapore. He graduated from the School of Art, Design and Media at Nanyang Technological University, majoring in Interactive Media. As a maker, he dabbles with web technologies and builds websites. Last year, Edmund took part in Maker Faire Singapore as a first-time participating maker and showcased his project, a geolocation-based travel app titled “Invisible Stickers” which is available at www.invisiblestickers.com. The app enables travellers to discover and geo-tag messages at their current location. Other travellers can see the messages when they are nearby. This works as a platform for travellers, nomads and backpackers to contribute their travel advice and recommendations. Our team caught up with Edmund to learn more about this project. How did you get started with “Invisible Stickers” and what were your inspirations? 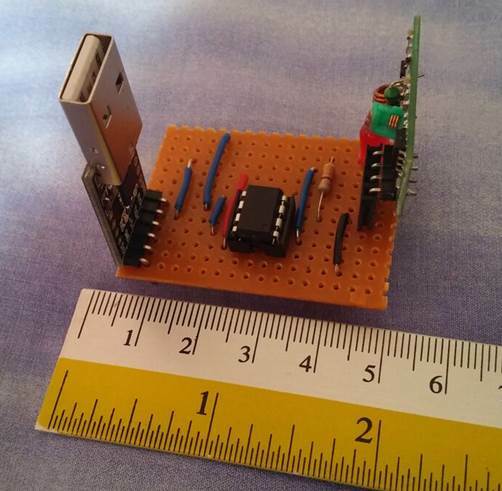 The project started as a Final-Year-Project in university. But the inspiration came from a backpacking trip during my university days. To prepare for the trip, I browse some travel sites and guidebooks to collect my own travel information. During the backpacking trip, I received a lot of travel brochures and free maps. These travel information amount to something substantial so I thought, “What if these information can be “planted” at the different location for travellers to access?”. Travellers can geotag messages at a location and others can access them when they are nearby. This would help other travellers too. After the trip and back in school, I started on my Final-Year-Project and decided to create an app for it. How did you know of Maker Faire Singapore? Are you familiar with the Maker scene in Singapore? Do you want to share some views on it? I know of Maker Faire Singapore through the Makers community. The Makers community is growing in Singapore. This shows that more projects are being created. But for the continuity and progress of these Maker projects, it will require more exposure, to test your creation and to get feedback. 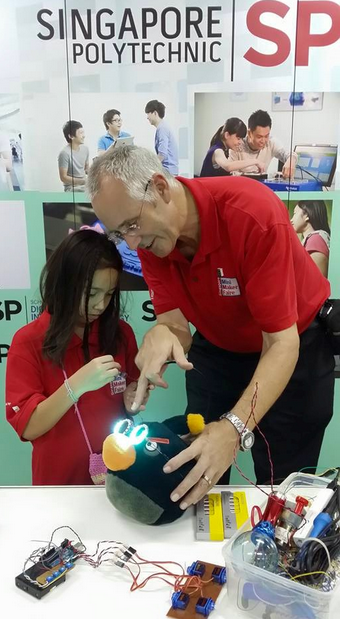 How was your experience at Maker Faire Singapore last year? It was my first time exhibiting at Maker Faire. The turn out was huge so it was good exposure. We received many feedbacks which we take into consideration. 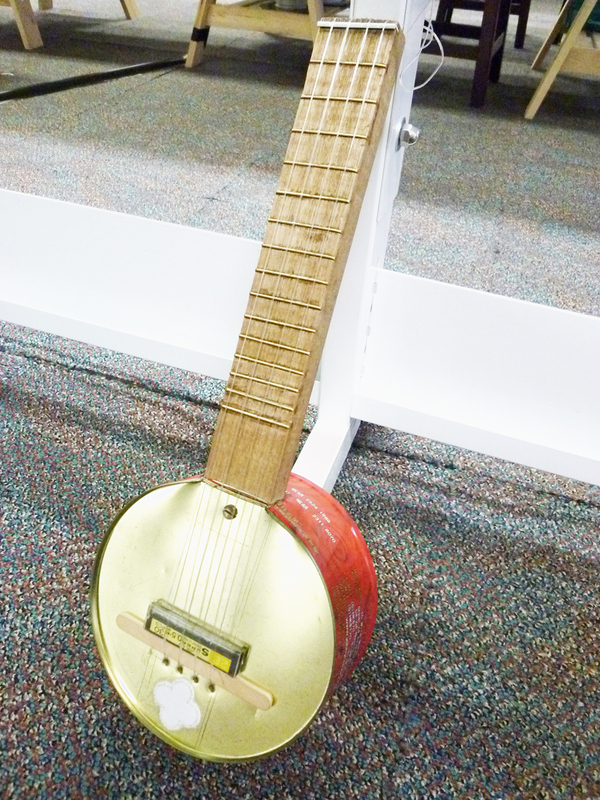 We also looked at what other maker’s creations as most of the time we are usually focused on our own project, so it is always refreshing to see what others are building. What do you hope to see at this year’s Faire? Last year’s turn out was very good. So I hope to see similar or even larger turn out for this year. What tips would you give to someone who is keen to join as a maker as Maker Faire? Don’t hide your creations. Turn up and the rest will follow. Interested to find out more? Mark your calendar for 25 & 26 June and come by SUTD for an exciting weekend! 2015 represents a special year when Singapore celebrates its 50th year of independence with SG50 and a year when Singapore begins to transform itself to become a Smart Nation through #BUILDSG. This commemorative year, the Ground-Up Initiative (GUI) community seeks to celebrate the pioneering Kampung spirit of building, invention and craftsmanship that has made Singapore to what it is today. Making has a deeper meaning than simply using your hands to produce something. In contrast to Singapore’s 5C definition of success like Cash, Credit Card, Condominium, Car and Clubs, Ground-Up Initiative (GUI) believes in building a new narrative for Singapore to be more Gracious, Green, Giving, Grounded and Grateful (5G) by building up the next generation. A Smart Nation is only as strong as the creative spirit and collective wisdom of its citizens. This year, at Maker Faire Singapore, the Kampung Builders have designed and curated 4 Experience Zones namely the Future of Agriculture, the Arts, Play and Sustainable Homes in search of building up not only the hardware and software, but the heartware underlying a Smart yet Wise Nation. Ground-Up Initiative (GUI) is a volunteer-driven non-profit community organisation that values connecting with the land for the many things it teaches us while cultivating a resilient and creative community with grounded leaders. In April 2009, GUI moved to Bottle Tree Park in Yishun, Singapore where it has collectively raised and grown its base, the Sustainable Living Kampung, from a mere 100sqm of space to over 1500sqm. This has enabled GUI to nurture a 21st Century Kampung Culture that connects many people to GUI’s vision of a 5G society, one that is more Gracious, Green, Giving, Grounded and Grateful. Since November 2014, GUI expanded to 26000sqm to construct the Kampung Kampus, a Nature-inspired campus for holistic education through experiential learning that has a low carbon footprint, featuring tropical sustainable architecture, building methods and technologies. Kampung Kampus is becoming a learning campus built by the community, for the community. 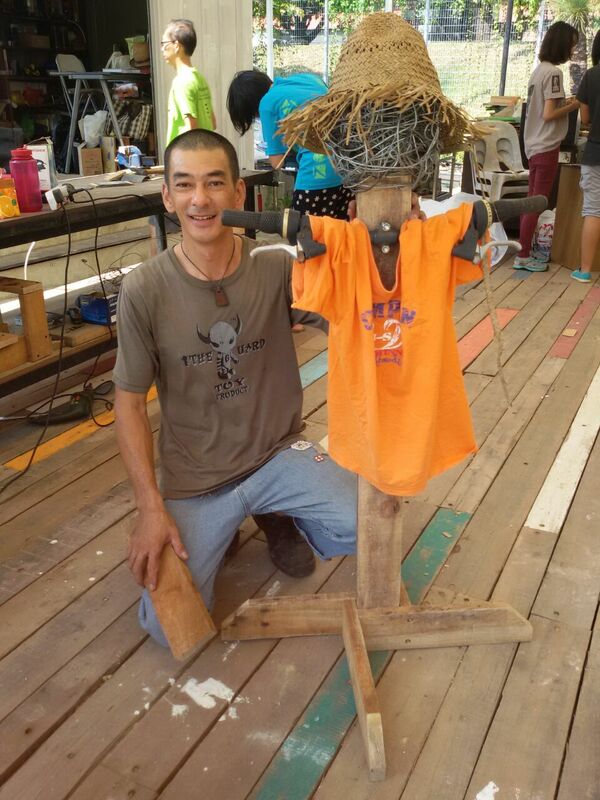 Through working shoulder-to-shoulder and hand-in-hand as one, GUI hope to rekindle not only the Kampung Spirit, but also instil a sense of ownership, resilience and creativity. Kampung Kampus will be a space that everyone of us can take pride in and love this spirit. I love putting blocks together. One more here, you get a building, one more there and we have a city! The best part however, is teaching someone else how to do it. Because together, we can build the world. What’s something interesting or memorable that you have made or built before? Train stations, libraries & cities. All with just card-boards! What will someone be experiencing with you at Maker Faire? 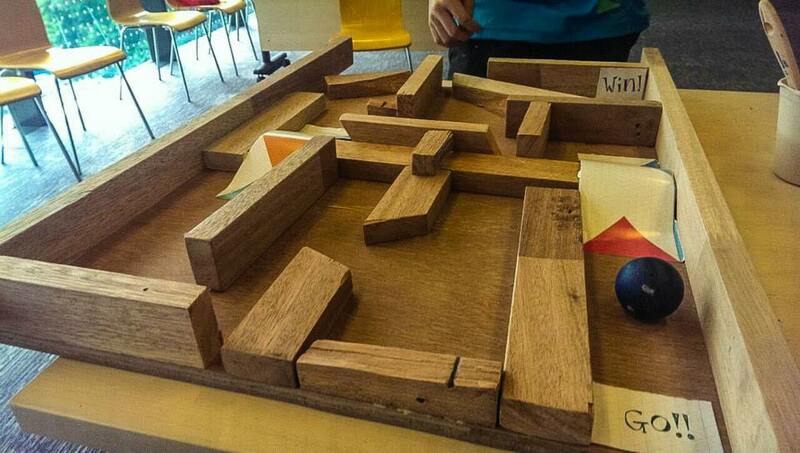 Kampung Play: They will learn how to put simple shapes together to make a Kampung Game! Architecture for Beautiful Communities: Learn how to put pieces of blocks and sponges together to create cities. Why do you believe that it is important for someone to share that experience with you? Doing the activities here not only creates opportunity for you to get your hands MAKING. It creates an avenue for people to connect! Kim Lee has been making stuff for as long as she can remember. She was fortunate to grow up in a pre-digital distraction age, in a house with garden space to play and experiment in and have a father who had a workbench and all kinds of tools. I designed Faberge-style eggs that were featured in a Her World magazine workshop (and also sold a Faberge-styled goose egg for $450 some 20 years ago). I also used to build props and sets for TV commercials in the pre-CGI era. I will not be at Maker Faire, but the activities I have initiated are building a wind chime or hanging mobile, creating a hanging screen with straws and small ornaments, and making toys out of cardboard rolls. In all the activities, the purpose is an exploration of possibilities. Any of these activities helps us to see everyday things differently, to repurpose them, to expand our appreciation of beauty, to discover and exercise our creative streaks. Craftwork is also a subtle and friendly understanding of sciences like physics (balancing elements in wind chimes or mobiles, finding out what things make musical sounds when clinked together), and art (a fun exploration of colour, textures, strengths and possibilities of different materials and juxtaposing them in a way that is pleasing to the eye). My favourite tool is the tool that does the job well and safely. It really depends on the task at hand. Perhaps the best tools you can have are at the end of our arms — our hands. They are the original transformer tools. You can poke with them, pound with them, brush something away, scratch something with a fingernail, or pinch, pull, push, squeeze, test something for wetness/dryness, pressure, sense heat, etc, etc. And just about everyone has two of these amazing “tools”! I love the feeling of making things with my own two hands. There is something about the feeling of tactility that you just can’t replicate with a computer. Even if the end product looks a little bit wonky, a little bit lopsided, it still contains a personal touch that makes it so special. I guess everyone can appreciate a bit of beauty in imperfection, eh? You will get a taste of how we make eco bricks at the Kampung Kampus, in cute miniature form! Have fun getting your hands dirty trying out pounding and sieving of soil, and mix different materials to press into our handmade mini brick moulds. At the end, you will get to bring home your very own mini-sized eco mud brick! 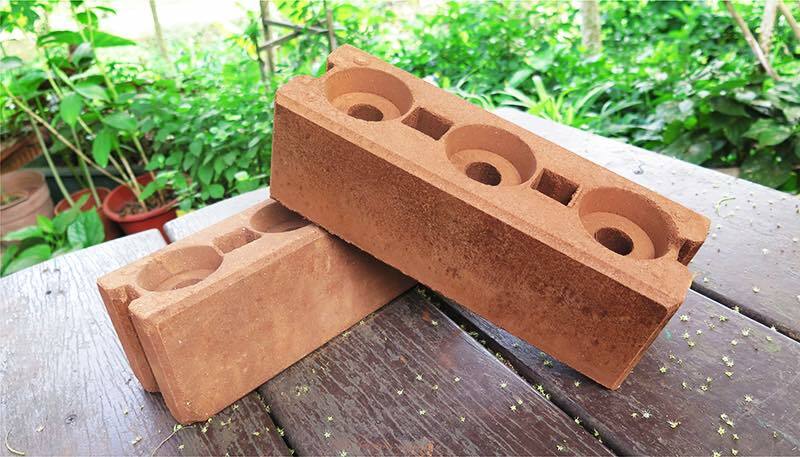 Through making low carbon footprint Mud Bricks out of “waste” Clay, one gets to understand how the life cycle of a building starts from the very materials it is made of. This brings awareness to how our built environments can be more sustainable and less destructive with a more conscious and responsible use of materials. Through making the bricks together as a community, one also gets to be involved in the actual process of co-creating our built environment. 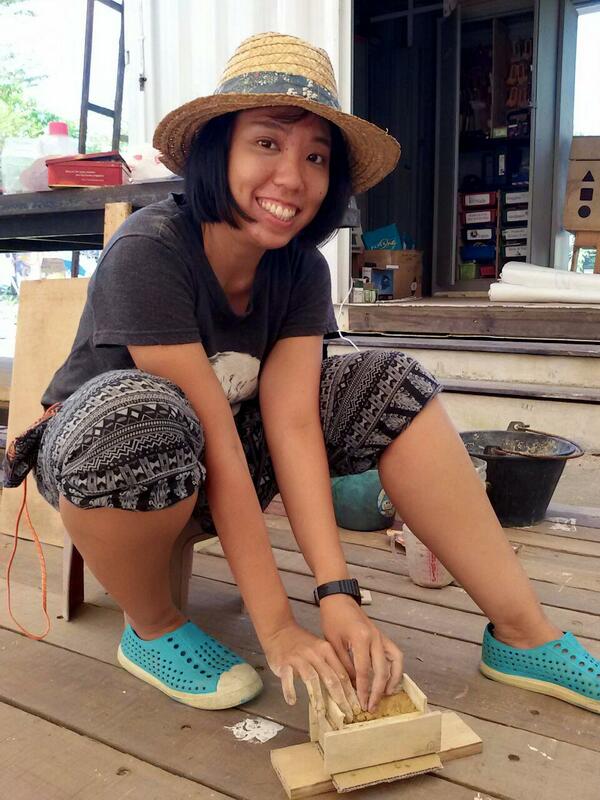 Following Maker Faire, participants can also join in the making of full sized Mud-bricks for building Kampung Kampus… Connecting people to people, connecting people to Land! Closer to a maker than a builder or a craftsperson. I enjoy developing new concepts and designing the mechanisms and controls involved but am a bit unpracticed in my craftsmanship. However, I still believe a good foundation in all three aspects is important and am still working on improving them. A rolling robot. 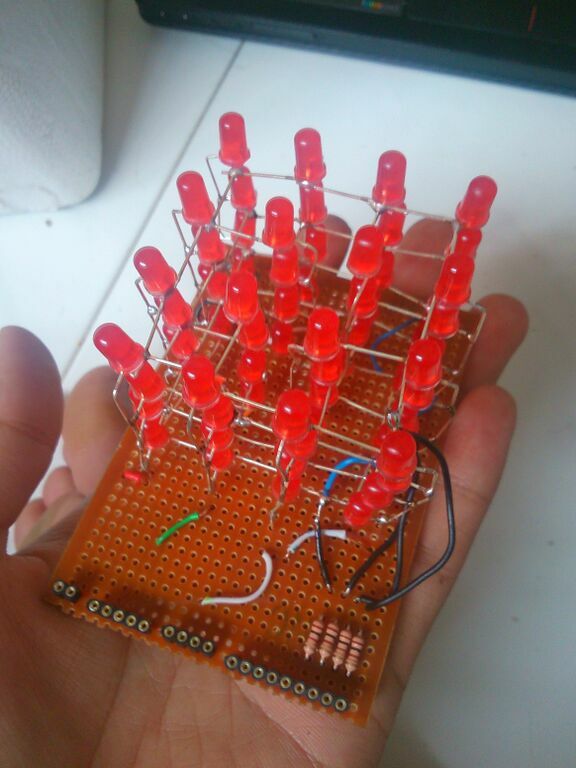 It is probably one of the more complex mechanisms me and my group managed to produce due to its size and power restrictions. Building it required a wide range of skill sets such as developing mechanical joints, circuit design and to control analysis which reflects the need for a good foundation in all aspects and teamwork to get things completed. On top of that, I had enjoyed the experience working hard with excellent teammates mutually supported each other through this grueling process. Past, present and future. Using technology to provide the backbone of the orchestra, old bottles and boxes of the past are renewed with a new cause to provide visual and audio entertainment to our audiences now. To develop a broad mindset. One does not have to engage in complex and tedious inventions to be called a maker. 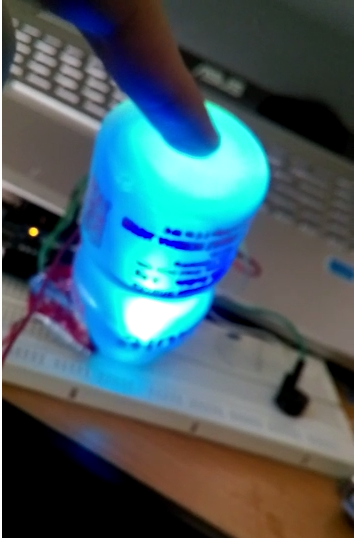 A simple act of finding an interesting way to cast a light (in a yakult bottle for example) is just as important as the circuit powering it. The same can be said for solving problems. Reusing old materials does not discount the need for new technologies. I hope I can introduce this interesting culture of making what you do not have from what you do have and broke down the illusion that making is only for the technically proficient or the technologically savvy. The brain and a pencil… And lots of paper to go with them. My focus as a maker is the value of things. Why buys things when I can make them myself? Things that I made come with fond memories that no purchased items; regardless of how expensive it is, can provide me with. The dismantling of an age old Queen-size mattress! My family of five embarked on this mammoth project together and we created a new bench with the wood frame and cushion; sold the metal parts for money and sew new pouches with the old cloth. Nothing was discarded at the end. Together, we not only created items but shared memories of my loving family of five. Beauty need not come at a price. Can anyone relate a normal paper clip with an artistic piece of handmade jewellery? If you can’t, join me and discover it yourselves. Beauty is from within and not from outside. If you feel good about an item that you’ve created, you’d feel proud and beauty would come along. ‘Making’ is ‘playing’ to me. Recycled wood, broken vase, discarded wire and are toys that I play with. To me, another man’s thrash is my treasure. I don’t know how to play computer games but I do know how to make functional things that we can use to sit on, display their favourite items or play with. What makes me happy is when others are enjoying their time around me. I had fun with most of the items that I made. 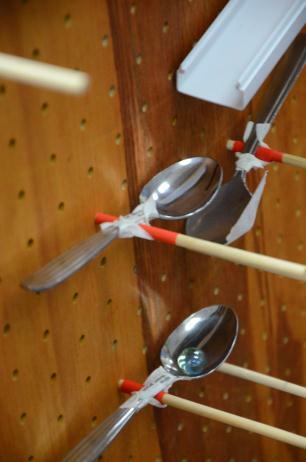 To discover that making can be a fun activity as well. My hands. They can feel the life of things that I touched and through my hands, help other to see them as well. Mr. Tang Hung Bun is passionate about growing food in a responsible and sustainable manner. 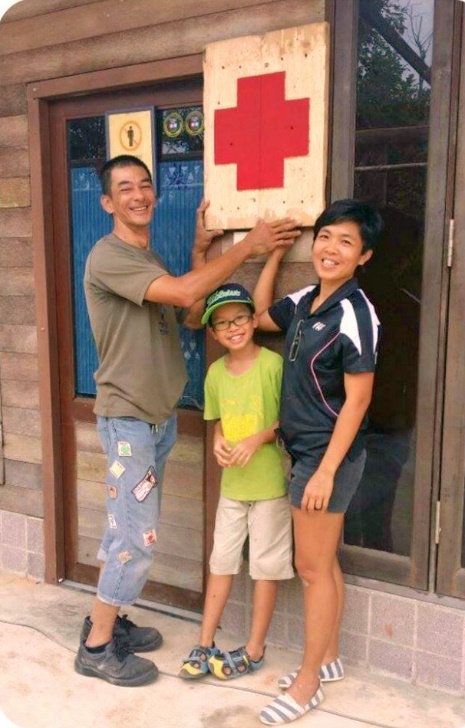 From June 2013 to June 2015, he rented a plot of land in Lim Chu Kang area and grew crops for his family and friends in a farm. He even created a permaculture food forest where he practised permaculture techniques to grow a diversity of crops, from leafy vegetables to fruit trees. Sadly, in May 2015, his farm was taken back by the landlord for “development”. In June 2015, Mr. Tang became a farmer in GUI where his continues his passion for organic and permaculture farming. Composting! Mr. Tang strongly believes that healthy soil grows healthy plants. Healthy soil is alive with an incredibly diverse and complete soil food web, a community of bacteria, fungi, protozoa, nematodes, micro-arthropods, earthworms, insects, etc. A good farmer should maintain the health of his soil by a range of techniques, including the use of compost. Composting is nature’s process of recycling decomposed organic materials into a rich soil known as compost. Anything that was once living will decompose. By composting your organic waste you are returning nutrients back into the soil in order for the cycle of life to continue. Finished compost looks like soil–dark brown, crumbly and smells like a forest floor. Besides Composting, we will also be teaching on how to make Liquid Fertilisers. There are lots of good reasons to compost and making organic liquid fertilizer – saving money and resources, improving your soil and reducing your impact on the environment. Adding compost to your garden will not only fertilize, it actually feeds your soil with a diversity of nutrients and microorganisms that will improve plant growth. Compost also increases soil stability, improves drainage and helps retain moisture. Chemical fertilizers on the other hand provide a quick burst of a limited number of nutrients that can wash away into our rivers and streams. They also adversely affect the healthy balance of soil food web. In our booths, visitors will experience how easy it is to make compost and organic liquid fertilizers. 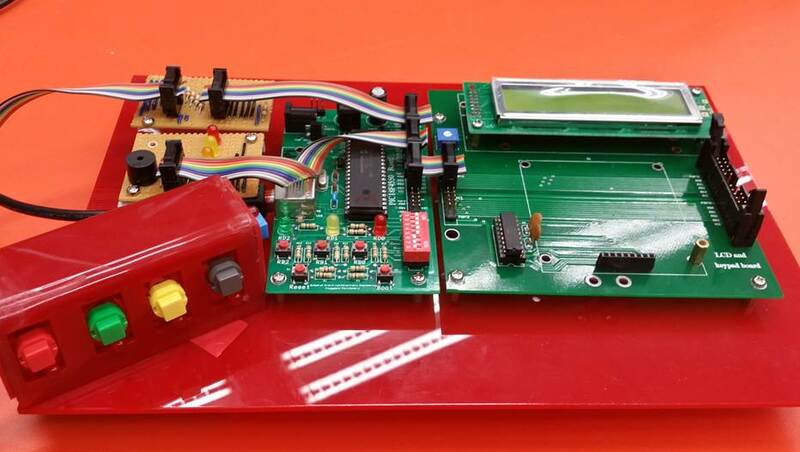 This is the fourth year Singapore Polytechnic (SP) is taking part in Maker Faire as a group. This year, SP is taking part with project showcases from staff and student makers. This list is not exhaustive, find out what you will see at their booth these two days! Showcase: Recycled li-ion batteries retrofitted to be rechargeable with multiple sources. 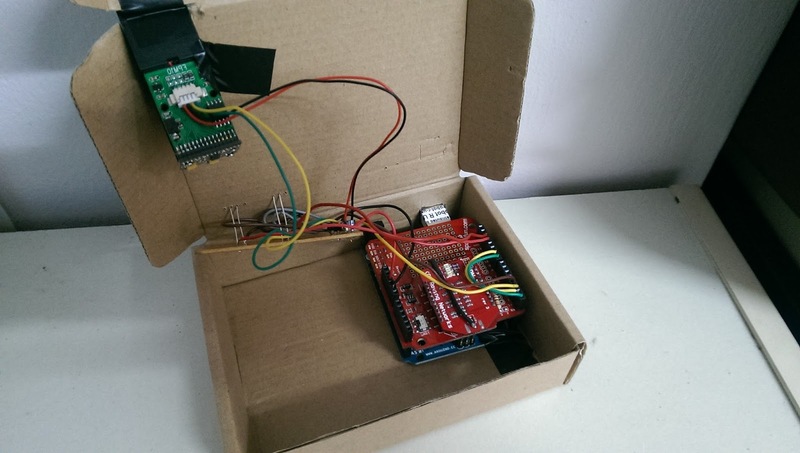 Showcase: IoT Enabled Food Cover with Contactless Thermometer and Humidtiy Sensor to prevent food poisoning. 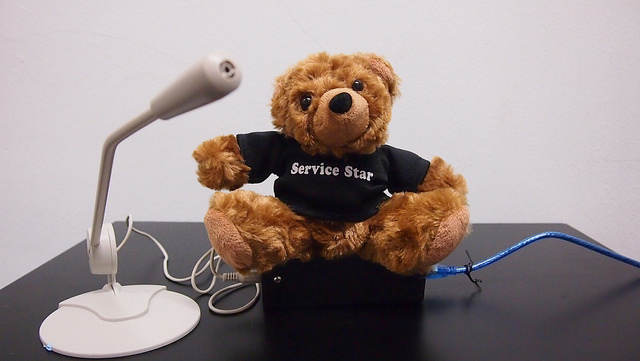 Showcase: Arduino-powered Honest Ted that allow an adorable bear to nod or shake his head when you ask a question over the microphone. Tinkering Studio @ Science Centre is a place where people get to tinker – to think with your hand and learn through doing. It is based on a constructivist theory of learning which asserts that knowledge is not simply transmitted from teacher to learner, but actively constructed by the mind of the learner. 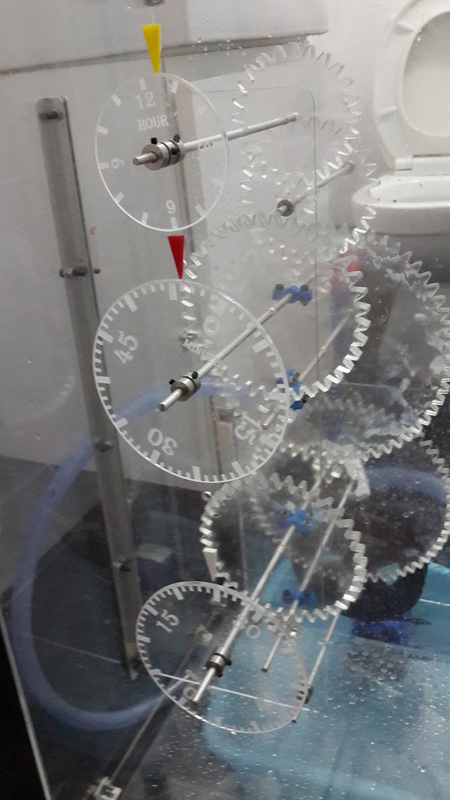 Tinkering Studio will be bringing the Marble Machine activity to the Maker Faire this year. Marble Machine is a creative ball-run contraption, made from familiar materials, designed to send a rolling marble through tubes and funnels, across tracks and bumpers, and into a catch at the end. Beside the basic materials like tubes and tracks, visitors will also be provided with random items like bells and kitchen utensils to bring out the creativity in them. Do check them out for a sneak preview at Maker Faire Singapore this weekend! One year ago, yarnbombing (street art using yarn to temporarily cover/ colour an area) was started as a community project at the Singapore Mini Maker Faire 2014. A community of about 10-20 came together and yarnbombed Science Centre Singapore, including the dinosaur display right in front of its lobby. The yarnbombing continued at Senja-Cashew CC where the event was held and the yarnbombers wrapped a huge pillar at the event venue with beautiful granny squares assembly. Each of the yarnbombers also took turn to leave some thoughts on making on that beautiful community artwork. Since then, the yarnbombers have moved on to create more projects, including the recent “This is Our Home Exhibition” in conjunction with SG50. Yarnbombers came together to crochet and knit 50 dolls representative of diverse Singapore, against the familiar backdrop of flats built by our Housing Development Board (HDB). They collected 70 dolls in the end. The dolls are a mix of different races and gender, and even two NSmen! There are cars, cats an cacti all made from yarn. This year, the yarnbombers, led by Mona, Yaney and Tianyun, are also going to yarnbomb the Maker Faire Singapore venue at 15 Tampines Street 11. Join them for their yarnbombing session from 11am to 3pm (11 July) at the Pink Room on Level One, and wrap structures like bicycle stand and benches. The group intend to use 12” x 12” granny squares (yarn square pieces made by crocheting or knitting) like the previous year, so if you crochet or knit, you are invited to make your own at home and bring down to the yarnbombing session. Everyone can then chip in to assemble the pieces and give a new look to the structures at the venue! For the uninitiated, you can also look forward to learn crocheting fundamentals at the session, or make pom-pom to fluff up the yarnbombed structure! Visitors can either bring these makes home, or hang them up at the yarnbombing area. If you have 8ply yarn at home and 4 or 4.5mm crochet hook, do bring them along and join in the session! Else, there will be some yarn and spare needles available for a hands-on experience too! Or if you are an avid photographer, this will definitely be a sight to behold and capture! Come join us to capture this either on camera or as colourful memories! 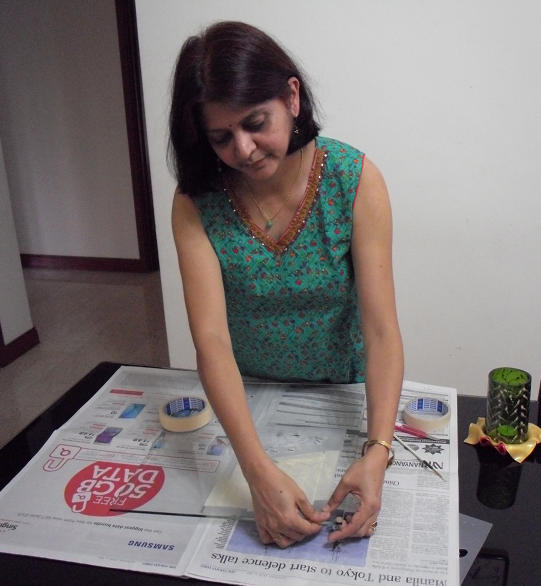 Next, we introduce Ichchha Walimbe from Art Lace Studio who will be showcasing her glass painted projects. 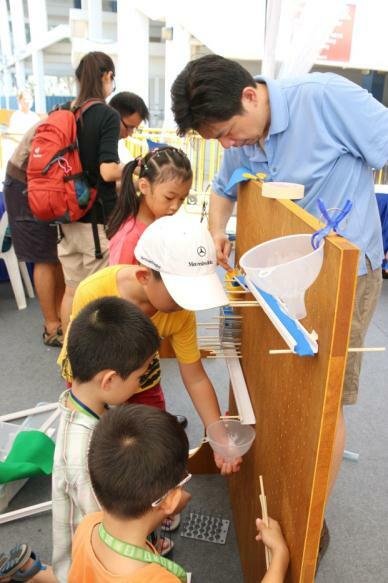 Maker Faire Singapore (MFS): Can you share with us your background? Ichchha: My background is in Interior Designing, and I worked as an Interior Designer for ten years until 2000. I have a passion for colours since childhood, and picked up sketching and drafting techniques during my professional work. I use my sense of colours and basic drawing skills in the glass painting that I do. I am inspired by nature, particularly flowers. I love flowers and like to observe their details and variations in colours. Flowers have a pleasant effect on our minds. I try to relay the same message through my creations. My glass painting journey began in 2005 with couple of bottles of colours making gift articles for friends and relatives. Later some of my friends convinced me to participate in various fairs and start selling online. That is when I decided to reach the outside people and started active participation in fairs from 2014. Traditionally, glass paints are used to colour any glass object but I have developed my own method to make flowers using glass paint and resins etc. I make my own hand painted jewellery accessories using a variety of materials. I make items that can be used/worn in your daily life which in other words means ‘an art in your day-today life’. MFS: What will you be showcasing? Ichchha: I will be showcasing hand painted tea light holders, coasters, key chains, home deco accessories and our special jewellery. Our special jewellery includes hand painted glass beads and flower jewellery. Some designs to mention for flower jewellery will be ‘Canna’, ‘Jasmin’, ‘Hibiscus’, ‘Frangipani’ and special ‘Sakura’ or ‘Cherry Blossom’ flower. I worked very hard to make the Cherry Blossom flowers but ultimately the pleasure was overwhelming. My products are smaller in size. Visitors to my booth will have to observe carefully to notice the detail work in smaller objects. I will also be displaying a cabinet door sample with hand painted glass. The ply at the back side of the glass can be dismantled. You can remove the ply and insert various background coloured/textured paper behind the glass. Every time you change the background, the cabinet will have a different look. I will be giving a demonstration on glass painting at the booth and providing small samples to those who want to try their hand in painting. MFS: You have started glass painting in 2005. What or who inspired you to start then? Ichchha: Yes, somewhere around that time when I was walking through an art shop when I came across few glass paints. I had never used glass paints before that so I decided to try the colours. My first trial was with a couple of colours. As I became a master in using those colours, I started using them more creatively. So I will say curiosity was my inspiration. 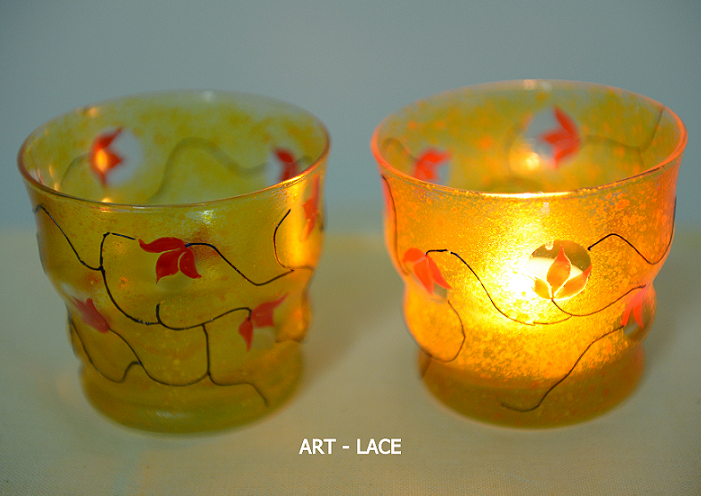 MFS: You have a wide range of glass painted products, including tealight holders, jewellery etc. Is there a piece of work or project that you have done which is most memorable to you? One of the most memorable project was the special Cherry Blossom flowers. Cherry Blossom flowers are not glass. Glass will make it very heavy and moulding the shape of petals using glass will be extremely difficult. I experimented on many different materials and correct method to bring that transparency in my product. It took me almost 2 months’ time to find the correct method and material for desired effect. 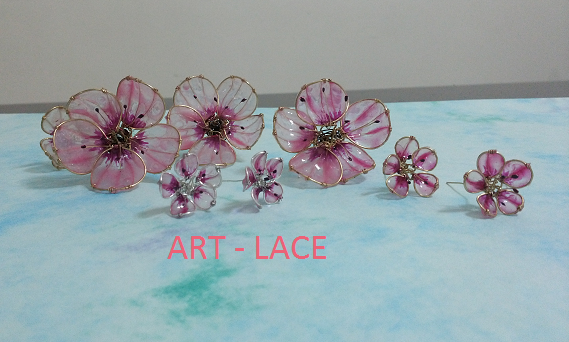 For flower jewellery, I use glass paints and resins with some other trace materials. Resin and glass paints have curing time of at least 12 hrs. So you need proper mould to hold the colours and resin in place and retain the shape. I had to experiment a lot to develop a technique. It was a milestone for me to develop this new technique. So these products are really memorable for me. Cherry blossom flowers were particularly difficult because of their small details, concave shape. Another smaller project which is also memorable would be the ted and yellow tea-light holder. Red, yellow, orange, pink go very well with the light, creating quite a dramatic overall effect. I think it is the best tea light holder among all tea lights I have so far made. 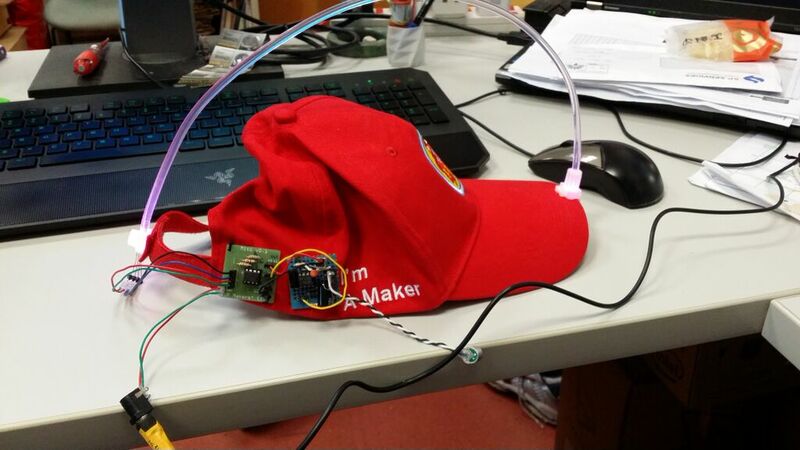 MFS: How did you know of Maker Faire Singapore? Is this your first time participating? What do you hope to achieve from taking part in the Maker Faire? 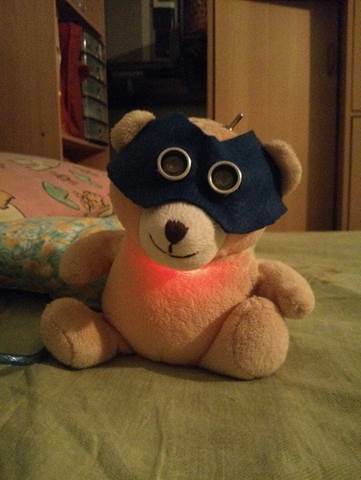 Ichchha: I heard about Maker Faire from one of my friends last year. I will be participating for the first time. It is a good opportunity to showcase your work to a bigger audience, to see what other participants are making and to learn from them. There are very few such opportunities in Singapore. So Maker Faire Singapore is doing a good job. MFS: Are you familiar with the Maker scene in Singapore? Do you want to share some views on it? Ichchha: The concept of making is more limited to digital and technology. The love for handmade crafts should be encouraged. There are several 3D printing showcases this year, and we checked in with YK to find out more about one of the groups, Volunex Solution Group that comprises of Volunex, 3Dspin, Mipox and Filalab. YK shared with us that the solution group covers instant scan, instant print and instant play, where the static printed figurines would be captured in motion via their portable/desk animation machine known as 3DSpin. Here is a YouTube video which will explain better how it works. Interesting, isn’t it? 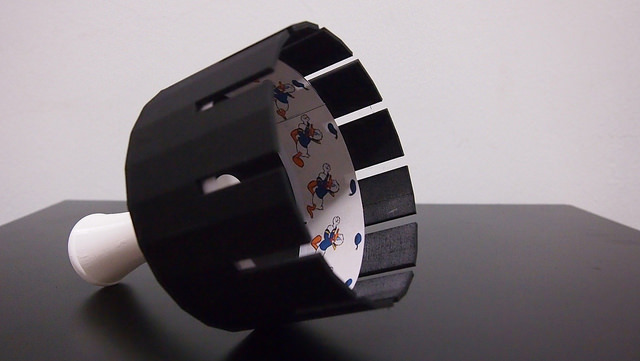 It resembles a zoetrope, a pre-film animation device that produces the illusion of motion by displaying a sequence of drawings or photographs showing progressive phases of that motion. 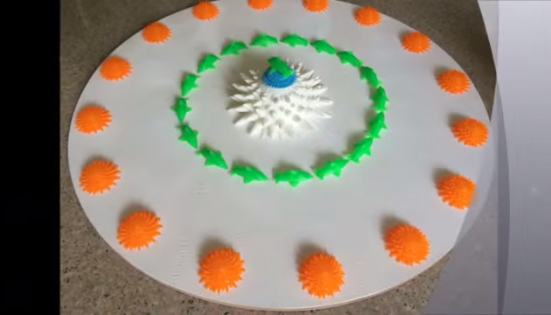 However, this uses 3D printed objects. Besides the 3Dspin, Volunex will also be displaying “Selfie in Motion”, Fibonacci related 3Dprinted animation, and an instant 3D animation of a fighter jet that can transform into a robot right in front of our eyes. Visitors to the booth will also get to try out 3D printing pens, and bring back 3D prints too! 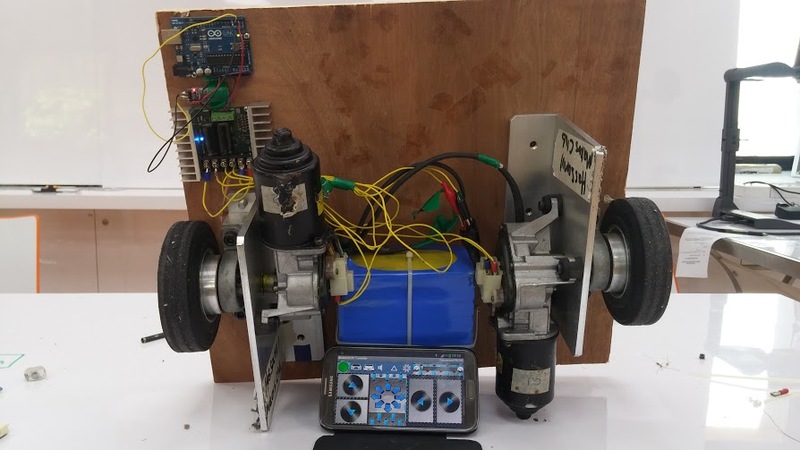 Check out Volunex Solution Group’s showcase at Maker Faire Singapore this weekend!